“It is Time to Study in Russia.” That is the message for students and others visiting the Russian Educational Fair which just ended in the Indian capital. Does Russian education meet the challenges of the contemporary world? RBTH finds out from university representatives and analysts. At present, close to 5,000 Indian students study in Russia. The number of students travelling to Russia for the first time comprises almost 2000 people, showing a growth of about 20 percent. “This rate of growth is continuing and we are extremely satisfied”, said Sayed Kamruzzaman, Head of Rus Education (India), a leading organization that sends Indian students sent to study in Russia. 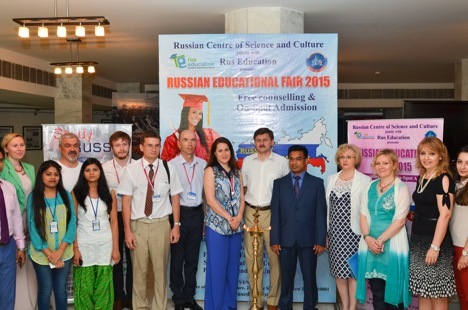 Traditionally, up to 90% of Indian students go to Russia to study at medical institutions. This year analysts have, for the first time, reported a growth in the popularity of other specialities. “These include IT, management, aircraft engineering, and oil and gas related fields”, he said. The most popular Russian university for Indian students has been the Tver State Medical Academy. Around 800 Indians study there, they have their own community and vegetarian café in the dormitory, and hold the largest festival of Indian culture in Russia. Kamruzzaman is convinced that Russian universities “are global leaders in terms of price and quality of education”. At the same time, Europe, in his opinion “as before, remains more popular from the point of view of students travelling there, expecting to find work and remaining there to live”. Viktor Katochkov, the pro-rector for international activities at South Ural State University, where 2,000 people out of the 50,000 students are foreigners, said he has given himself the task of increasing the number of foreign students gradually from five percent to ten percent. So far the annual increase is around 500 foreign students. “At the moment we have students from 36 countries studying with us,” he said. “I believe that the BRICS countries are very promising in terms of attracting students, and also, generally, the idea of establishing a Network University for this group, which will provide assistance from leading educational centres from Brazil, Russia, India, China and South Africa,” Katochkov said. A decision has already been made to establish a BRICS Universities League, which the top five universities of each country can join. Answering a question about advantages of Russia’s provinces in comparison with Moscow, Katochkov explained that, as was previously the case, they have lower educational fees associated with a lower level of salary, meaning that universities are unable to increase charges for education. “We have conducted a study and calculated that, as a whole, life and study in the provinces is 2.5 times cheaper for a student than in Moscow”, he said. These figures are also confirmed by representatives of the Ural Federal University, which is currently home to more than 30,000 students from 60 countries. Read the full story at Russia&India Report.